A quick update to say that the morels have decided to stay for another week in Berlin-Brandenburg, giving me the chance to bring home this mixed quarry of black and ‘yellow’ morels (Morchella elata & M. esculenta). The weather has been alternately warm and sunny, then windy and rainy, which might just have provided the right climate – I gathered the second half of this batch in a hailstorm! Though one or two gave the game away standing quite out in the open, the choicest of the lot were tightly packed under the stems of low shrubs, almost completely hidden from sight. What’s more, as if by way of testing my knowledge, this brain-like false morel (Gyromitra esculenta) saw me coming, nesting nearby the edibles, and so I used the opportunity to make a photo ID for others (it’s also posing as a snake in the grass in the first photo of this entry, top-left); if it is not specially-prepared but rather mistaken for a morel, consumption of this mushroom regularly leads to a severely unpleasant poisoning, which is not uncommonly deadly. Anyone with a grasp of the common Latin epithets of plants and fungi will notice the contradictory nature of the species name (esculenta = choice, delicious). 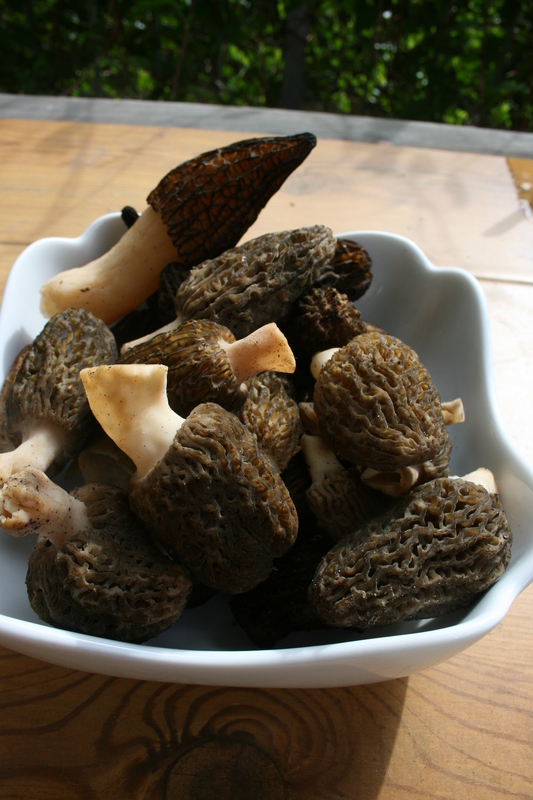 A number of cultures (Scandinavian, Polish) prepare false morels to extract the poisonous gryomitrin (a toxin of red blood cells); still, its classification as a choice mushroom in the regular sense is no longer accepted. 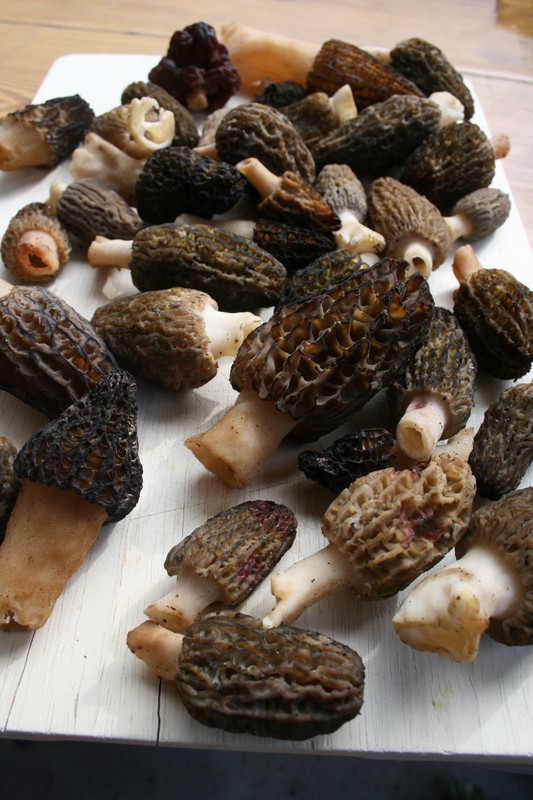 For the fact that it can grow among edible morels, it’s worth knowing how to tell them apart. Left: Morel. 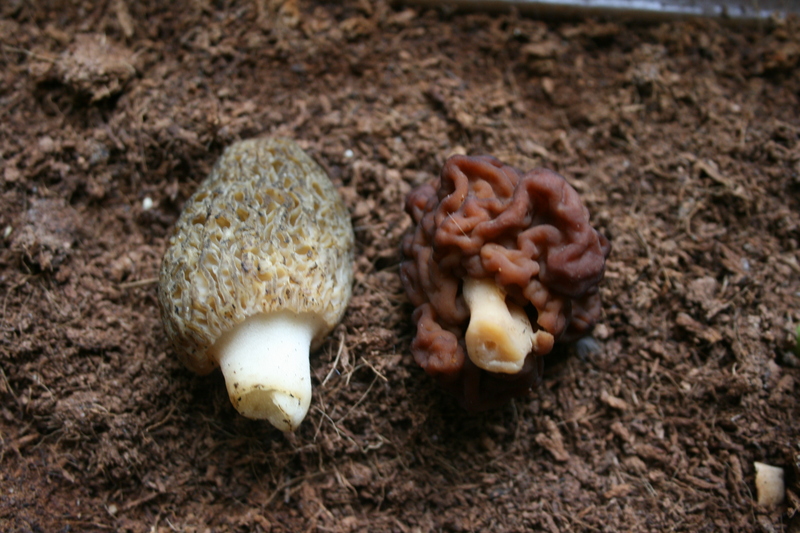 Right: False Morel. 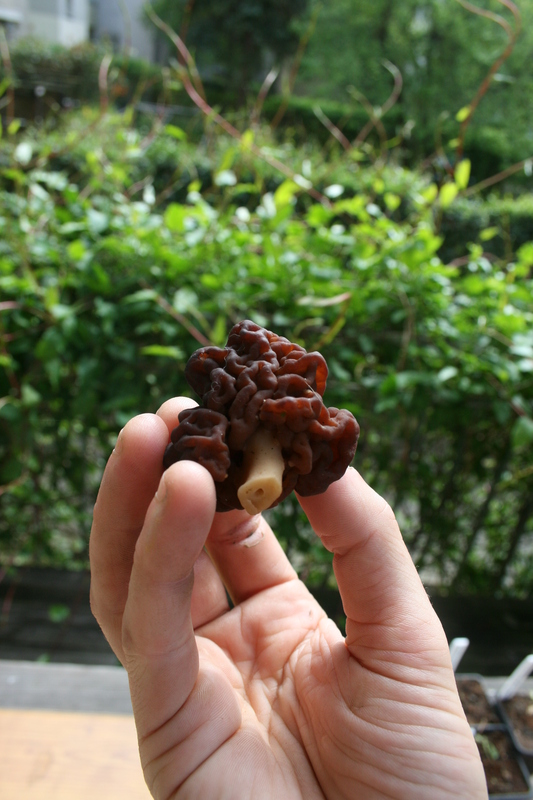 Note that colour is no sure indicator; false morels can also be light and dark brown. So now my mind is spinning as I think of what to do with this sudden gift from the mushroom gods, and I am just as thankful for the gift-reminder of the potentially-deadly find; after al, it is just as important to encounter as its edible likeness. Happy foraging!